The bestseller among the self-adhesive magnetic tapes! 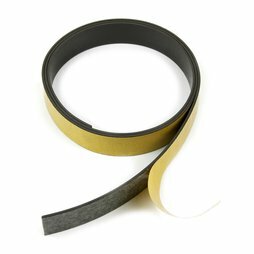 This 20 mm wide self-adhesive magnetic tape is made to attach non-magnetic objects to metal surfaces. it is also great for fastening fly screens magnetically. This magnetic tape is available in lengths of 1 m, 5 m, and 25 m. It consists of strontium ferrite and flexible plastic. On one side it is coated with an adhesive. The adhesive force is 102 g/cm2. The longer the magnetic tape the higher the adhesive force. For heavy objects, we recommend a large enough magnetic tape. The self-adhesive magnetic tapes are not a suitable surface for magnets. They would demagnetise the tapes. A better surface for magnets would be our magnetic strips. The tape is anisotropically magnetised, which gives it a higher adhesive force than many other standard magnetic tapes. Compare the adhesive force indications before making your decision. Also signs can be hung up with little effort and no damage to structures.